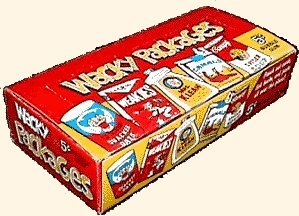 Summary: There were many kinds of wrappers with different designs and colors used for wacky packages over the years. Each wrapper has a unique identification code number. Even the original series wrappers changed in each new series. 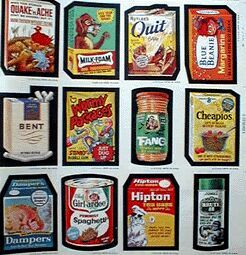 The Die Cuts and Wacky Ads wrappers are somewhat scarce. 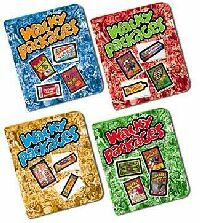 Summary: Just as there were many types of wrappers, there were also many different wacky packages display boxes with different designs and colors. Original diaplay boxes can be difficult to find and are popular with many wacky collectors. Summary: Based on the stickers from the original 16 series, these 24 posters were sold in 1973 and 1974. The artwork on the posters was a stretched and modified version from the stickers, making them look slightly different. 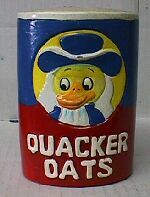 The only original design was #13 Wacky Garbage. Summary: Sold by Topps in 1973, these tatoos came packaged as a single tattoo and a stick of bubble gum. Based on early stickers from the original 16 series, there were 57 different tattoos in the 2 sets of 30 because 3 titles were never issued. 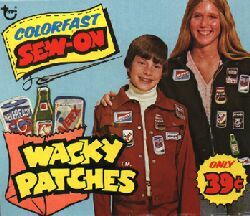 Summary: Sold by Topps around 1974, these sew-on patches were sold in stores like wacky packages. 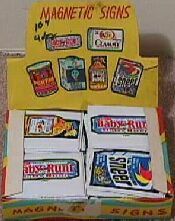 There were 12 of them: 6-Up, Poopsie Cola, Crust, Neveready, Jail-O, Wormy Packages, Gadzooka, Fang, Ajerx, Kook-Aid, Crakola Crayons and Grave Train. 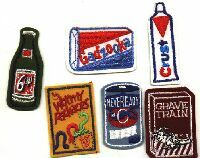 Shown is a picture of he advertising for them, click the picture to see the patches. Summary: Original Jay Lynch Wacky Packages Art has become quite valuable and popular with collectors and can be found at auctions and antique shows around the world. 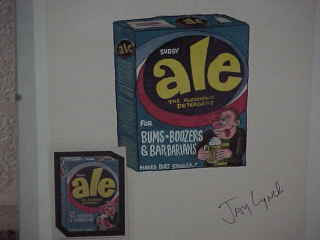 There are some wacky collectors out there paying big bucks for original wacky art. Summary: Uncut sheets are very hard to find. Very little known about them other then there being one or more from each series. 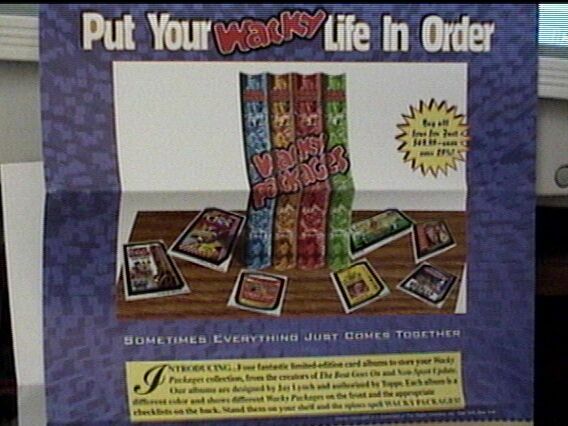 Since these were never actually sold by Topps, they must have been taken right from the factory, probably by employees at that time. 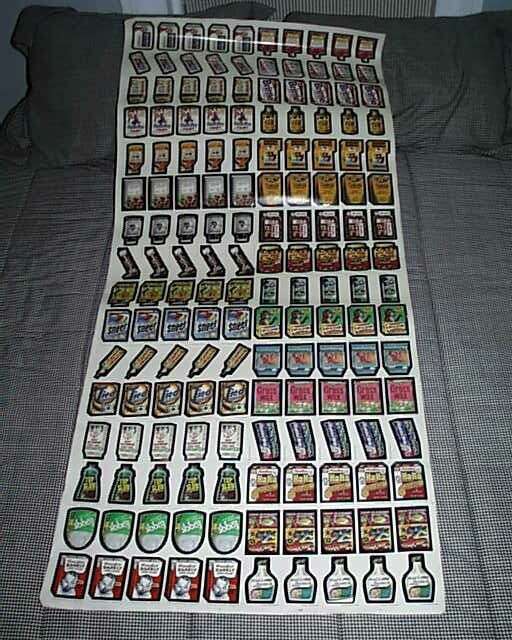 My brother purchased a very large uncut sheet at a flea market that you can look at by clicking here. Summary: Not made by Topps, they were actually made in Tiawan. 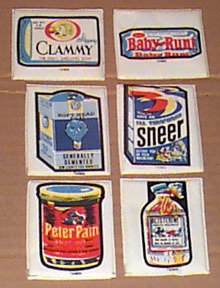 There were 6: Baby Runt, Blisterine, Clamy, Sneer, Peter Pain and Soft Head Bubbles. Harder to find banks: ? Summary: These wacky banks were made in the 70's. 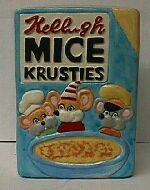 I have 2 of them: Mice Krusties and Quacker Oats. I have never seen any others so I don't know how many there were. They are approximately 5" high 3" wide and 2" deep with a slot at the top and a rubber stopper on the bottom. Chalk banks were popular in the 50's, 60's, and 70's. Summary: These Wacky Albums are now avalable from Non-Sport Update to store your original series collection in. There are 4 of them that hold 4 series each. Check out the original flyer that was sent out here.